Felix Pivec putting the new Vader through it’s paces – seems to go ok! FKM: How are riders responding to your boards? BF: Our kitesurf business continues to grow. We saw a significant ramp up with the release of Daniel Thomson’s Vanguard, which changed the industry’s perspective on what a great kiteboard could be. The Vanguard set the standard for a new design trend and riders quickly recognised the benefits of this shape for the kiteboarding industry. Our business continues to grow on a global level fuelled by the release of these models and the continual improvement with new shapes. FKM: What is some positive feedback you have received? We consistently hear from our customers about how different the ride and feel of the Vanguard and Vader is compared to other boards on the market. Riders have said that the upwind performance is fantastic and the way the board responds to rider input and turns is instantaneous. However, the boards are still extremely stable due to the parallel outline. There’s also more surface area in a smaller outline. Then there is the modern planing hull design versus a displacement hull. You can think of a traditional shaped board as being similar to a boat bottom in that it is designed to sit down in the water. A MPH is designed specifically to create lift, produce less drag and plane higher in the water. This is why our boards generate so much speed, flow and responsiveness as told by our customers. Just that the boards can be hard to find due to the high demand. We regularly check in with our riders, forums and dealers and are constantly looking for feedback regarding improvements on board characteristics. Some riders have mentioned that they initially felt they had to purchase a larger size within the Tomo range. It can be tough for some people to get their head around riding such a small board when traditional shapes dictate a much longer board. It was quickly realised that smaller sizes could still maintain the float for a rider (thanks to the modern planing hull design) and they moved to. FKM: Have you noticed all the kite brands now release similar shapes? What do you feel Firewire still has over these? BF: Absolutely. Unfortunately there’s a misconception that simply cutting off the nose of a board, making the rails more parallel and marketing a ton makes a great board. The reality is there’s much more going on with our boards than our competitors have tried to recreate. This comes first hand from many of our customers who thought they needed the same board brand as their kite manufacturer or figured the bigger kite brands couldn’t be wrong, but later found our boards to be on an entirely different performance level. The truth is it’s not only the outline but the unique performance bottom design combined with the rail, nose and tail design that make our boards outperform anything else on the market. The bottom of our MPH designs are extremely technical and complex, applying years of research and Tomo’s mathematical formulas into the mix. FKM: Any new models on the horizon? BF: We will soon see the release of the Evo, our most symmetrical kiteboard outline to date and a butter smooth ride. The Evo, with its double inside single concave into a split quad concave bottom design and nearly symmetrical outline, develops even more float than prior MPH models. The amount of lift this board creates is immediately apparent and it feels as though it’s levitating above the water as you build speed. It’s an extremely stable ride with minimal drag and high speeds. Its willingness to connect carving turns feels like a fluid magic carpet ride. The Evo’s bottom contours generate so much lift it’s intended to be ridden even smaller than prior MPH models. The Evo will be released in a 4’10”, 5’1” and 5’3”, will come in a 5 fin configuration and you can scale down from the Vanguard or Vader by 1”-2” shorter accordingly. FKM: What are your thoughts on the market for the boards? 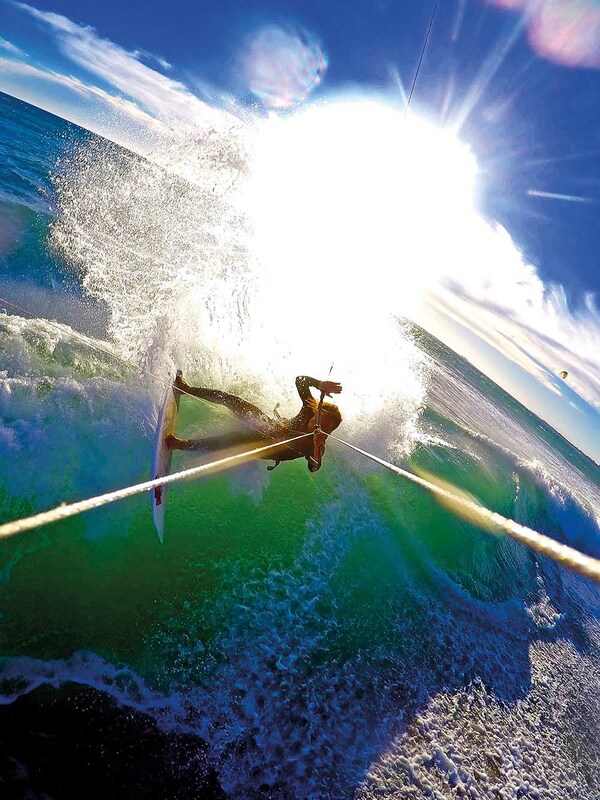 Kitesurfing is so small compared to surfing, are you finding it worth your while? BF: Yes. Firewire is one of the largest board manufacturers in the world and in collaboration with leading designers it produces some of the top shapes ridden by today’s surfing professionals. We are extremely fortunate to have access to such impressive designers and to build technology to bring to the kiteboard industry. While there are kiters that ride our standard surfboard models and construction these boards aren’t designed for jumping and heavy riding. We felt it was beneficial to provide the kiteboard community a select group of kiter tested shapes that had additional structural reinforcement to withstand the added forces that kiteboarding places on a board. While kitesurfing is a small portion of our overall business, it’s a unique area that continues to grow and we see this area constantly evolving. No more chicken loop? Introducing Cabrinhas Fireball! Firewire Cornice – What Next?